Most states require that Dry Cleaning businesses obtain a specific industry license as well as register with their local government. Depending on the types of materials used in the dry cleaning process, a registration with the state's Department of Environmental Protection may be required. City and/or county local business licenses may be required based on the location of the business. Dry cleaning businesses may also be subject to sales tax depending on the type of services offered. 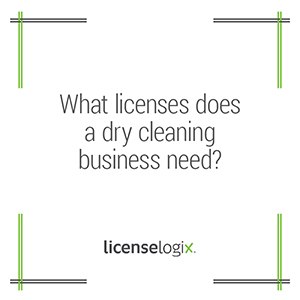 For example, in New York, a Dry Cleaning business is required to obtain a Laundry/Dry Cleaning License from the city or county that the business will be operating in. Businesses that provides self-service laundering must also obtain this license prior to opening. Common license application requirements include a copy of the lease or proof of ownership of the facility, certificate of insurance, and other detailed business information. In addition to the Laundry License, the state also requires laundry businesses to disclose the chemicals used in the laundry process and post a disclosure form at the physical location of the business. In Massachusetts, a Dry Cleaner Certification form is required as well as a registration with the Massachusetts Department of Environmental Protection. The certification requires the facility's environmental practices and proof of compliance with MassDEP requirements. Licenselogix will identify all local regulations and licenses related to your business. We will ensure that your business obtains all the proper licenses and registrations as well as manage your ongoing license renewals to ensure continuity in your compliance. For additional help you can click contact us, or give us a call at (800) 292-0909.